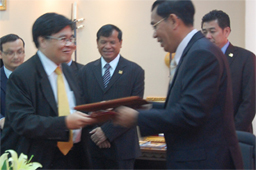 On January 19, 2011, the Ministry of Tourism, Cambodia represented by its Director-General, H.E. Mr Tith Chantha, signed the Memorandum of Understanding with DISCOVERYMICE, represented by its President/CEO Mr Lee Choon Loong to co-organise the 3rd World Ecotourism Conference 2011 in Sihanoukville, Cambodia Bay, Kingdom of Cambodia. The 3rd World Ecotourism Conference (WEC) 2011 is jointly organised by the Ministry of Tourism, Cambodia and DISCOVERYMICE, an affiliate member of the United Nations World Tourism Organisation (UNWTO) and produced WEC2009 in Vientiane and WEC2010 in Kuala Lumpur. 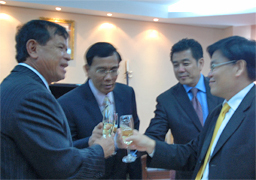 After months of research and planning, the Memorandum of Understanding (MOU) between the two parties was signed in January 2011 and it has been mutually agreed that the WEC2011 will be held in Sihanoukville, Cambodia Bay from 3rd to 5th October 2011. The Ministry of Tourism is responsible for leading and administering tourism in Cambodia. Pursuing international co-operation in the field of tourism. Based in Kuala Lumpur, Malaysia, DISCOVERYMICE is an international consultancy focused in producing and planning international meetings, global conferences and events in the Asia Pacific region. Established in 2004, we are firmly committed to implement new and innovative solutions in development of vibrant tourism nations. Through global conferences and information technology, we bring about new changing tourism policies that has impact on sustainable tourism development, natural and cultural conservation as well as responsible tourism through capacity building and education. Our broad and in-depth expertise involves both private and public sectors. As such we are uniquely competent to bring forth an appropriate mix of skills, expertise and experience, allowing us to act as a bridge between Governments, companies, academia and NGOs in respect of joint collaboration/ventures as well as private/public sector partnerships.